My grandmother has looked after me completely since I was about four; my mum couldn’t cope after my dad died and handed me over to her mother. I see my mum a couple of times a month, but she’s always distant and awkward, and not much fun to talk to. My gran’s house is huge, a mansion to me when I was younger: covered in mirrors, with many bedrooms to run in and out of, and a long, loping landing covered in light blue carpet that I spent many nights with friends rolling around and playing board games on. At the end of this landing, is the bathroom. Tiled and decorated in the late 60s, it will never win any awards for interior design. Everything is a not-so-subtle shade of lime green, including the bath (which always makes a horrible gurgling sound when the plug is pulled) and the toilet. The only thing that looks out of place is a huge mirror on the wall, which stretches about 3 feet and is directly opposite the bath. I had never particularly enjoyed the bathroom-well no one really does- it serves a purpose and is used functionally-but if you stood at the dark wooden door and looked out along the landing, you could see all the doors to other rooms, and the rooms themselves if their door was ajar. In the dark, this was terrifying. It was like being stared at and surrounded by gaping black holes-and there was always a feeling that something was going to come out of them. The bathroom was like the vantage point, the place where you could see the entire top level of the house. One evening I decided that my hair was greasy enough and my body dirty enough to need a scrub, so I ran the bath and studied my face in the mirror, throwing off my clothes onto the plastic laminate. I closed the door, shutting out the sounds of gran making dinner downstairs. Soon the water steamed and was deep enough to sit happily in, so I sat gingerly down and folded my legs. I’d forgotten how relaxing baths were, after having just showers for so long. If I bent my head slightly, I could see my body and the bottom half of my face in the metallic surface of the overflow plug, which was slightly above the water level. Thinking idly about the events of the day, I glanced at my chest in the plug, and rolled my eyes over to my shoulder. And stiffened. 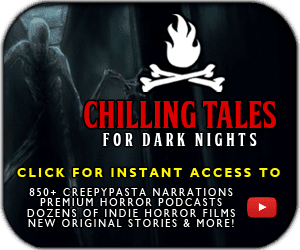 Terror and a sick curiosity overcame sense; I twisted round in a panic and churned the water as I span; my back scraped against the lid of the bath as my neck snapped to see what had been sitting cross-legged behind me. There was nothing there. Just small ripples bouncing against the end of the bath from where I’d rocketed sideways. Water had enveloped the floor when I’d turned, and was now dripping in a steady stream down the side of the bath. Silence. I shook my head and felt more than a little foolish, and sighed in relief and embarrassment. How could there possibly have been anyone there-there was no one in the whole house but me and gran, cooking dinner downstairs. I could hear the radio in the kitchen. Wait. I hadn’t been able to before-the bathroom door had been closed. I leant over the side and gripped the bath with shrivelled fingers. If you stood at the dark wooden door and looked out along the landing, you could see all the doors to other rooms, and the rooms themselves if their door was ajar. They all were. The landing carpet, so baby blue and inviting, was now peppered with dark blue, and all the doors were open.